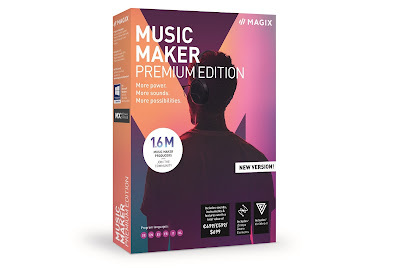 To make our YouTube video reviews we use a mixture of different photographic kit. Probably the most useful things are the couple of Joby GorillaPods we have, both to grip cameras and attach anything from a microphone to a action pole to wherever we need it. Often, depending on what we're filming, we use our phones to capture the goods, and that is growing trend, especially amongst YouTubers (phone cameras are getting better, after all). To that end we decided to check out a bunch of new kit from Joby, designed specifically for smartphone photography. 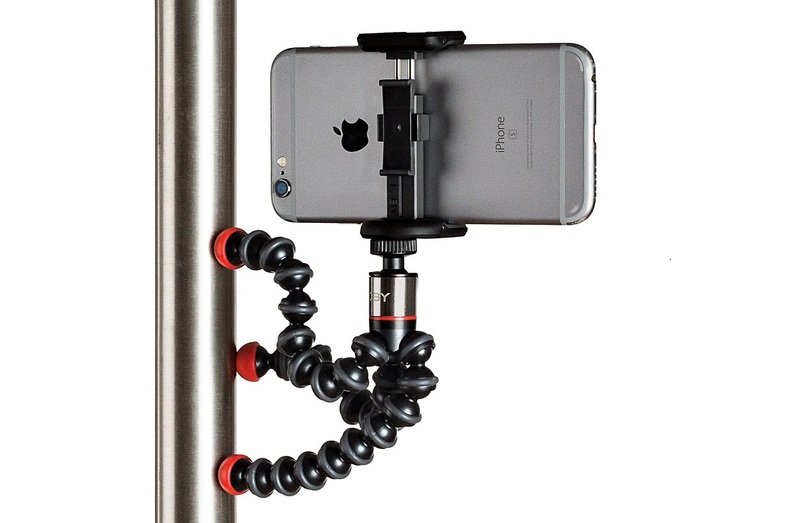 The GripTight ONE Magnetic Impulse is a great way to get started if you're venturing into the world of smartphone filming, because as well as including a GripTight accessory for clamping onto your phone, it also features a small GorillaPod. 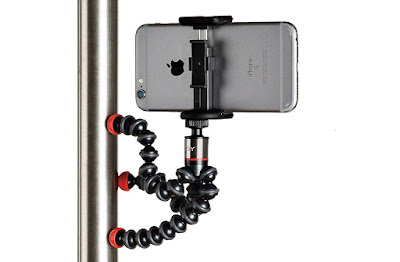 It therefore acts like a tripod and hand grip, and because the GorillaPod features magnetic feet, you can stick it to some metal surfaces for a firm hold. The GripTight ONE Magnetic Impulse also comes with Joby's Impulse Bluetooth shutter. This lets you line up your shot, get the perfect angle, then take the picture (y'know, of yourself) at just the right moment from afar. No messing with camera timers anymore. Yay! The GripTight clamp can be unscrewed leaving you with a very versatile GorillaPod, a very good use for which we demonstrated in this video. This mount is designed for smooth and easy camera movements, and can be screwed onto any existing GorillaPod (or even anything with a standard tripod screw). It is a tough and stable phone grip - far stronger than the spring-reliant GripTight clamp, using a hearty screw on the rear to secure your phone in place. The clamp sits on a very smooth joint, and the adjustable protruding arm helps you to glide it up and down, left and right. That clamp can be very easily changed from landscape to portrait, and the arm can be raised or lowered, either to your preferred angle, or to get it out of shot. We used it both with an existing GorillaPod, and also with a full-sized tripod. Either way lets you make smooth static movements, which isn't something you normally expect from typically shaky smartphone footage. Even if you're not bothered about those smooth movements, the GripTight PRO Video Mount still offers a very firm and reliable phone clamp, and gives great peace of mind when carrying your phone around in there. For phone vlogging, and for quick and easy operation, the GripTight POV Kit could be the real winner. This is another sturdy clamp, using a tight level to secure your phone, that also features a fold out handle. With it you can handle your phone without having to touch it, keeping the entire screen free of fingers. Importantly, the GripTight POV Kit comes with a removable Hot Shoe mount which can clip to either ends of the clamp. On there you can mount a microphone to plug into your camera, or even a light - whatever you need to make the scene perfect. Those slots can also accommodate a Joby Impulse Bluetooth shutter, which is also included. Which is nice. The handle can be used either fully folded down, or kept folded up behind the body of the phone. Either way is fine, but we found the latter to be a bit more comfortable and natural. As the clamp is tight and secure, it gives your hands a bit more freedom while hoisting your phone around, so you can concentrate on getting the shot. Finally, this little pocket-friendly pal could come in handy for any number of jobs. Essentially this is a GripTight clamp, just as comes with the Magnetic Impulse (only in white, which is awesome) but also a small folding metal tripod. What folds up nice and tight, actually expands to confidently hold upright even large and heavy phones. The stand features a tough ball joint in the centre, allowing you to angle your phone though a few degrees, either to grab a shot (we think its is perfect for leaving your phone alone to capture some time-lapse or long exposure shots) or for watching your phone's screen to consume some well-earned media. Even if you have no intention of using your phone to take photos or capture video, the GripTight One Micro Stand is a fantastic and rugged phone stand.